This is our 3rd week of Instagram Travel Thursday (Tip: click the link and add your Instagram account there), and it was amazing to see so many new people to join in last week! 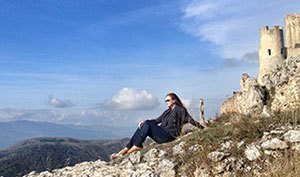 If you would like to have a reminder email each week when the linky is posted, please subscribe to the special Instagram Travel Thursday prompt email. Our purpose is to unite the travel community on Instagram. Today I wanted to give a few very simple tips how to make your travel photography better on Instagram, I have been asked many times to write about this topic, and even when I was writing my book some were hoping I was going to write about actual Instagram photography. 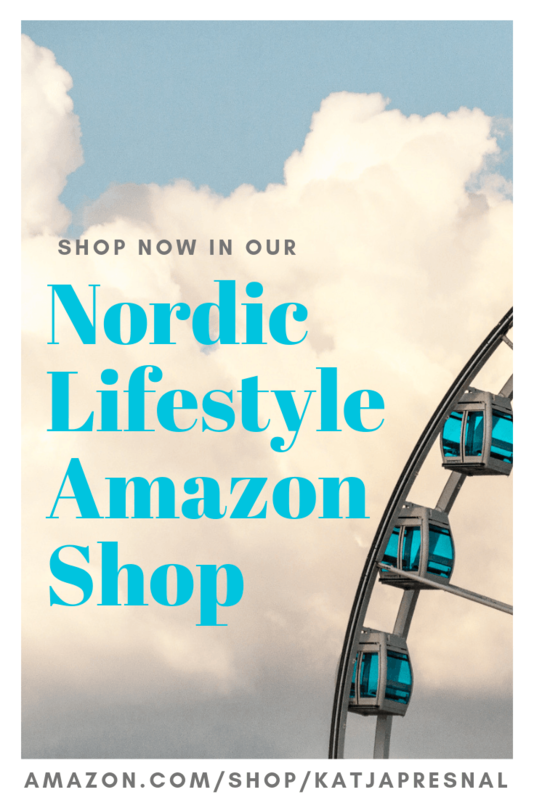 My book Instagram as your Guide to the World – How, What and Who to Search and Follow on Instagram to Help You Travel the World teaches A LOT about Instagram, but doesn’t even touch the subject of taking better photos! 1. Wait for the right moment to take the perfect photo and tell a story. 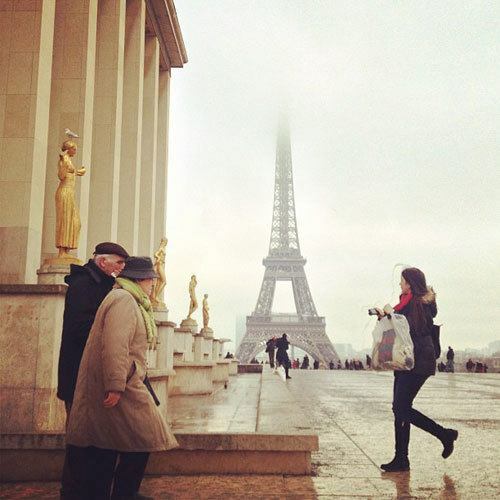 Timing your photo right is the key to many travel photos. When you are in a busy tourist attraction it is difficult to get the perfect shot without too many people in it, but be patient and wait for the shot. Sometimes the shot can be the picture of tourists taking pictures of each others – it tells the story of the tourist spot and gives it much more deeper feeling than the normal sight shot. This is my photo of the Eiffel tower. It was a cloudy day, impossible to get the travel brochure perfect shot of the Eiffel towel, and everyone knows what it looks like anyways so I wanted to show that locals walk by this beauty everyday without even looking at the tower – and us tourists frantically walk around to get the best photo. A shot of the tower wouldn’t just have told the story and how I saw the tower that day. We also often want to take pictures of the pretty hotels we stay in and just share the feeling “wow, I love staying here.” I stayed in the InterContinental Hotel in Montreal this summer and absolutely loved it, the room was spacious & luxurious, but my favorite was the killer view from the window. Timing the photo right made all the difference – during day time there was so much light it was difficult to get the view. Six hours later with the city lights — can you just feel how the city view popped from the window during my stay? While the room was luxurious and there were many details to take the photo of, the most powerful shot of the hotel room wasn’t about the room at all. 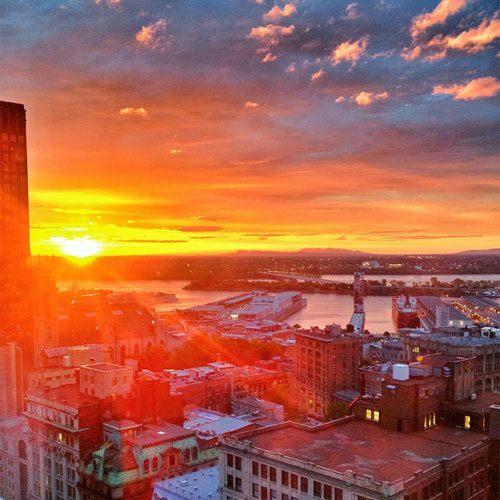 It was the fact that I woke up to a beautiful sunrise over the city of Montreal. When it comes to taking photos in natural light (and especially taking photos of sunrises and sunsets! ), timing is everything. 2. Think details that tell the story. 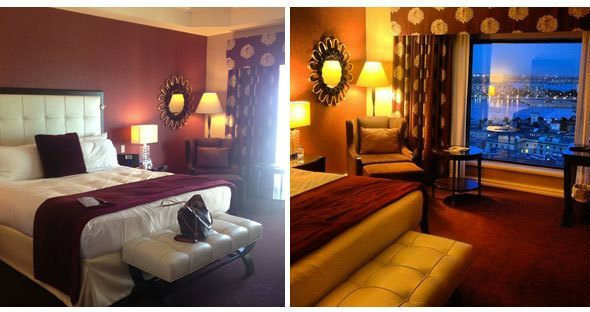 While a large view from the window isn’t a “small detail” even the sunrise shot shows a detail of the hotel room in a much specific way than the other pictures of the hotel room where the view is seen just from the window. The best “detail” of the hotel room wasn’t even a picture of anything in the room! 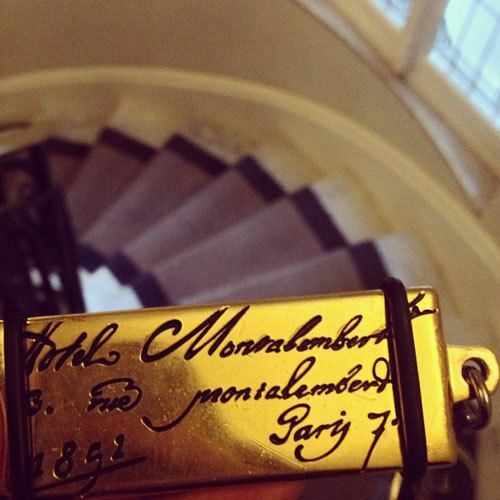 Another detailed picture in a hotel was this hotel key picture I took at the Hotel Montalembert in Paris. The key and the spiral staircase behind it tell enough of a story that this small boutique hotel is both classic Parisian and luxurious. 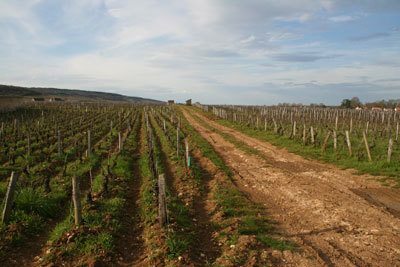 When I was vising wineries in Burgundy area in France, it was early on the spring and there were no grapes, and not all that much greenery what you think of French wine country. So here is the picture of the vineyards and while it shows the vineyards, it just kind of falls flat of telling how I felt with the majestic view and stomping on some of the best wine-land in the country. A detailed picture of grapes would have been golden… but since there were no grapes, I took a detailed picture of the small shag instead. 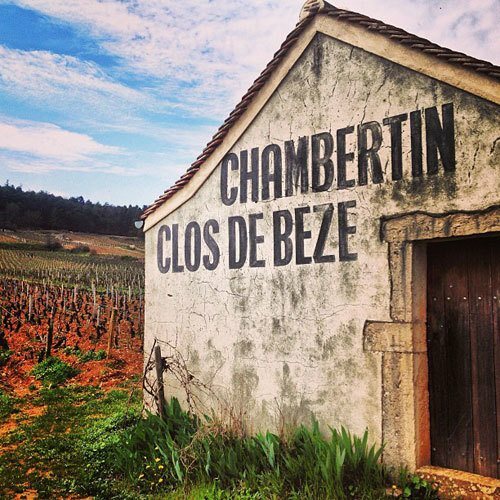 You still get the vineyards, but now added “some fancy wine text in French” aka the name of the winery and edit the photo so you can see the cracks in the building to see how old it is.. you immediately get the story of the place better. And I’m not even trying to get a “green” shot of the fields, but showing the spring season. Here is also another completely different shot of the famous Eiffel tower. 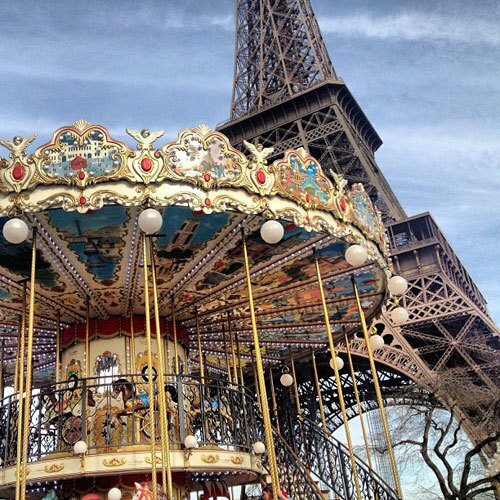 Paris is known for many carousels and there is one right next to the Eiffel tower. This time I wanted to go into details and focused in the detail of the carousel ticket booth and how you could look up and see through and see the Eiffel tower. Yet another completely different angle and look at the famous landmark and a way to make my shot look different. 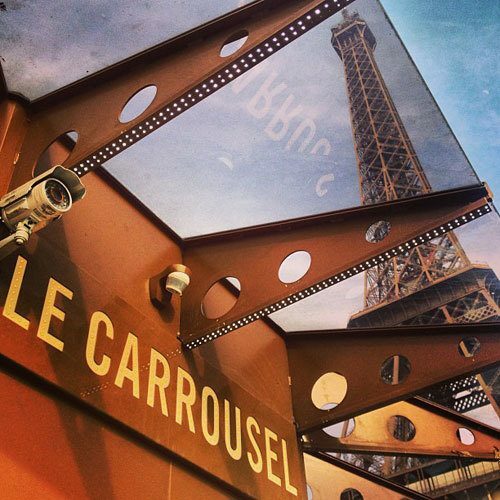 Of course this carousel picture shows it all. 3. Photograph people but tell the story. When you are traveling, you want to take family pictures and remember the trip, and how your family looked the day. You want to see yourself in the locations, and snap the smiles of the kids. I get it. Depending who your Instagram followers are, but unless it’s just your mom, they will probably be more interested in seeing something else than the National Lampoonish family travel shots of everyone with the same “cheese” smile on the shot. 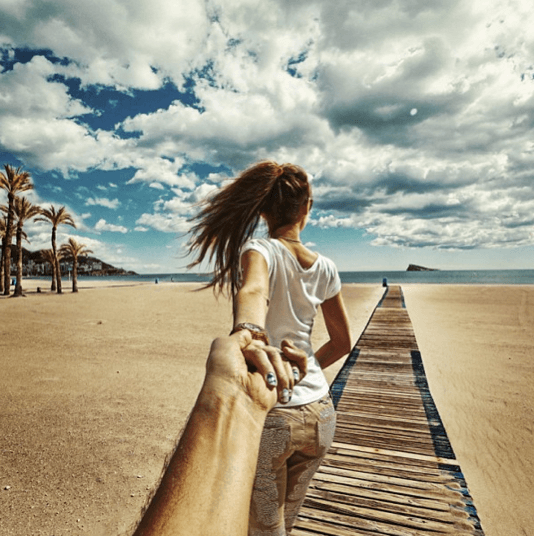 One of the most famous photographer’s on Instagram takes pictures of his girlfriend from the behind in different locations of the world, his name is Murad Osmann, and one of his shots is below. He started by tagging the first one #followme and now has become some sort of world sensation. While he is an amazing photographer with superior editing skills and a supermodel girlfriend, there is still something to learn about. Take pictures of your family from behind, sneak in to take a photo when least expected, and go for photo angles that don’t show everything. 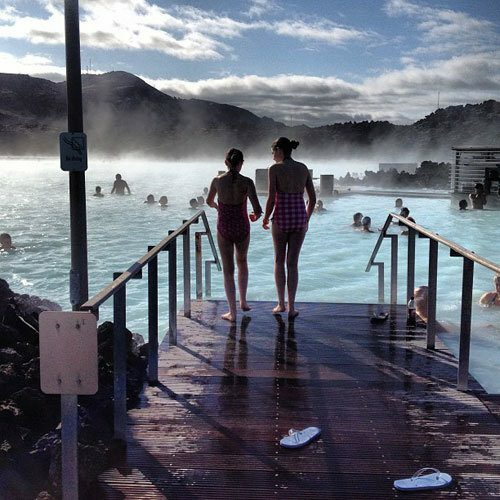 I took this picture of my girls from the Blue Lagoon hot springs in Iceland. It’s not the “follow me” shot, but it tells a story of sisters traveling together. 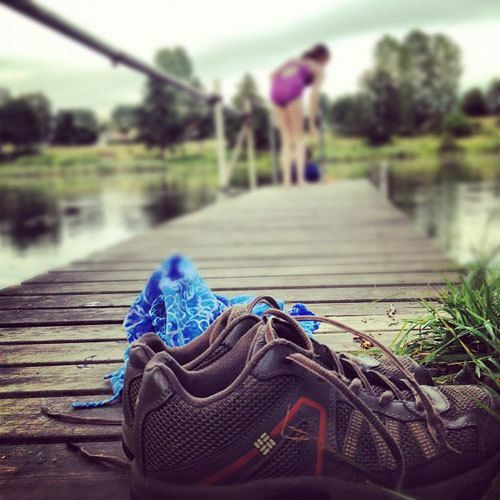 Here is another “going swimming” picture, and same as in the above you see the shoes left on the dock, but on this photo I used tilt-shift I really focused on the shoes left on the dock to tell the story how we just walked to this dock, and took our sundresses and shoes off and went swimming. All of the above tips had one in common: tell the story. Above all, think of using Instagram to tell the story of your trip in photos and that a person who scrolls down your pictures from the trip doesn’t even have to read the texts to see what the trip’s highlights were for you or how you saw local people, the food, the architecture, the feeling of the place. Here is one photo from Rome, taken when we walked from our apartment to Campo de’ Fiori to buy breakfast – the locals were on their bikes and busy going to work, as we were on vacation and went to buy croissants and fruit for breakfast from the market place. 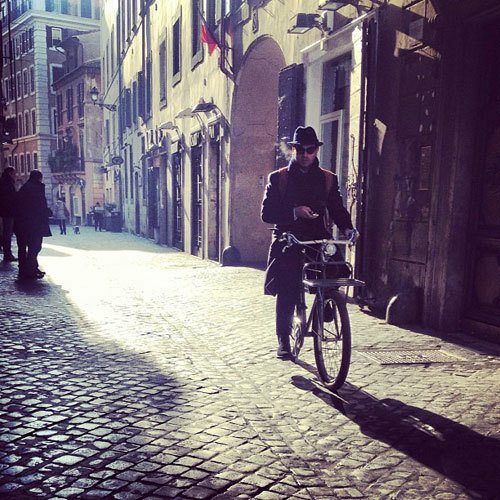 The timing, the lighting and the person biking with a phone in his hand all tell the story of a well-dressed Italian man hurrying to work. It might not be your typical tourist photo, that’s exactly why people want to see travel photos on Instagram – they don’t want your family vacation photo album, they want to see the location through your eyes. Please leave a comment if you found any of these tips helpful and would like to hear more. Join us! Bloggers – add your blog post to the linky. Not a blogger? No problem. 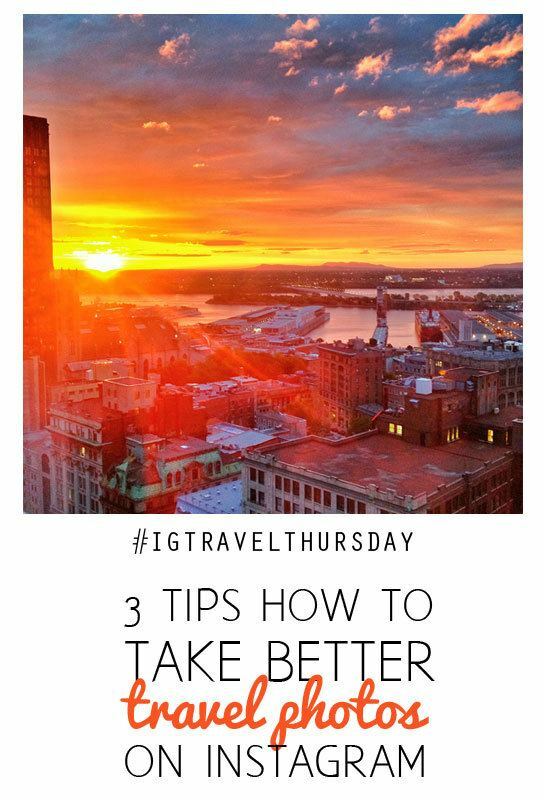 Join us at Instagram by using hashtag #igtravelthursday and share your travel photos. But sorry- no linking to Instagram images from the linky, just to blog posts, and the blog post has to be somehow related to Instagram and traveling. This blog post cements your position as my new go-to for Instagram travel advice. Great seeing you (albeit at a distance) today! Pingback: Using Instagram on your vacation. These are great tips Katja! I definitely like capturing people shots from strange angles–but you are so right about waiting for the right moment–sometimes if you just pause long enough to look around- there is so much more.